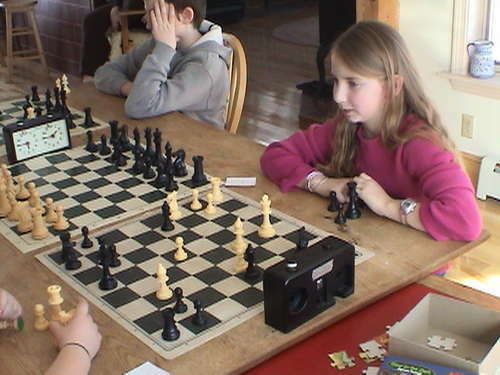 You can access this information from any ChessMaine.net page by clicking on the Maine Chess Club Directory link. the name and email address of a contact person for more information. Thanks! Tuesdays 5:00 p.m. to 10:00 p.m.
Fridays 6:30 p.m. to 10:30 p.m.
Wednesdays 6:00 p.m. to 10:00 p.m.
Tuesdays 3:30 p.m. to 5:00 p.m.
Tuesdays 6:00 p.m. to 11:00 p.m.
Last Thursday of Each Month 6:00 p.m. - 8:00 p.m.
Fridays 4:00 p.m. to 5:45 p.m.
Saturdays 1:00 p.m. to 5:00 p.m.
Thursdays 6:00 p.m. to 8:00 p.m.
2nd Saturday of each month 10:15 a.m. to 11:30 a.m.
Sundays 9:00 a.m. to 1:00 p.m.
Thurdays 6:00 to 8:00 p.m.
Every Other Tuesday 4:00 p.m. to 5:00 p.m.
Thursdays 5:00 p.m. to 8:45 p.m.
Thursdays 3:30 p.m. to 5:00 p.m.
Days vary 2:30 p.m. - 4:30 p.m.
Mondays 6:30 p.m. to 11:00 p.m.
Saturdays 8:00 a.m. to 9:30 a.m.